Caroline is a Consultant in Emergency Medicine working at University Hospital Coventry in the UK. 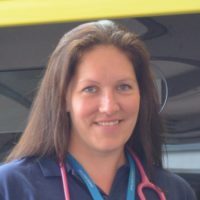 She is an experienced pre-hospital doctor with The Air Ambulance Service in the West Midlands, and a Training Programme Director for the sub-specialty of Pre-Hospital Emergency Medicine. Caroline leads on the organisation and delivery of several popular study days and conferences including the West Midlands PHEM study day, Trauma Care, and The BASICS and FPHC Annual Conference. Caroline became an Associate Editor of the Emergency Medicine Journal in 2017. Caroline is a strong supporter of less-than-full-time working and resilient job plans within Emergency Medicine. Specialist interests include major trauma, pre-hospital emergency medicine/EMS, team leadership, training for rare procedures, burnout and compassion fatigue.